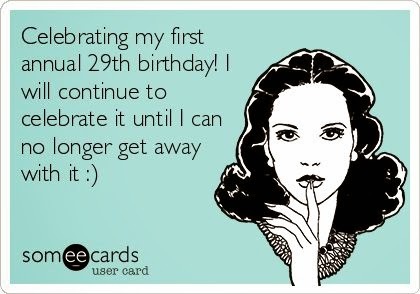 As a child, I remember my mother and grandmother using "29" as that magical age that they always seemed return to with every passing birthday. Back then, I couldn't even begin to the imagine the day that I myself, would reach this monumental milestone, but alas, here I am. The official last year of my 20's has begun. Looking back to those childhood and even into my teenage and college years, I must admit that I had a different perception of where I would be at this point in my life. I had always thought that I would be married a year or two out of college, with an established career and my first child by the age of 25. My husband and I would be living happily with our growing family, and with all of our hard work and planning, life would be picture perfect in a humble city home by the age of 30, no doubt. Flash forward to real life. I got married this past summer at the ripe age of 28. We are currently kidless. And I often spend my days pondering if there is something more that I can be doing to make an impact and difference with my life. And honestly, if I could change all of it for my previously picturesque scenario, I wouldn't. It is great to have a plan. But as I have continued to grow older (and I like to think wiser), I know that God has a plan of his own for my time here on this earth. And the way things did play out, is the way they were meant to be. I love my handsome husband. I can't wait until we start a family. And I look forward to continuing to reflect on how I can grow and make a difference each and every day. And while I used to believe that 29 was that magical age where time stopped and life just couldn't get any sweeter, in my "wise-old age" I have come to realize that 29 may just be the beginning of so many sweet things still to come. Happy Birthday!!! You make a difference in your kiddos life daily. You are impacting the lives of every kid you teach. :) I am jealous of your bucket list idea too. Enjoy your day. We need to do dinner again soon.